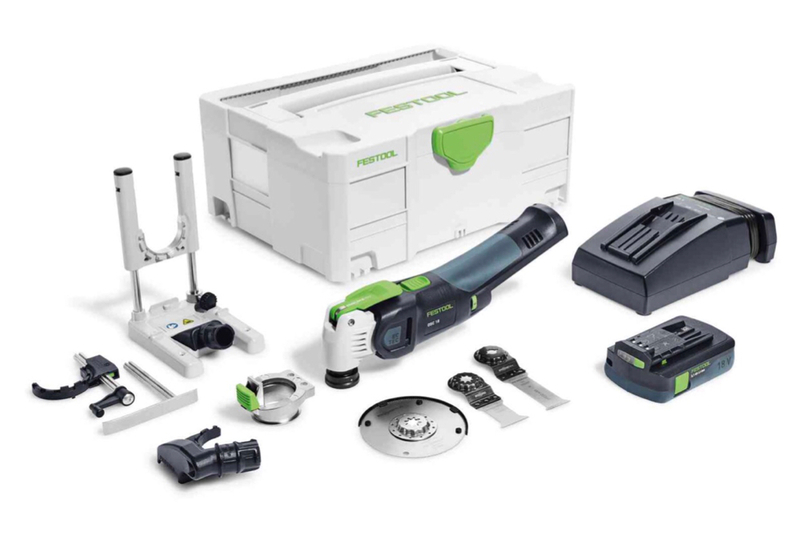 New blades from Festool will also be available. The plungebase is quite interesting. Any reason to believe these accessories won’t be compatible with the corded Vecturo? Has anyone seen anything official that addresses backwards compatibility explicitly? Good question, however some of those accessories are already available for the corded one. They look identical to me. Not sure if they share the same part # but i would guess a YES! For that matter, I don't see why the accessories won't be compatible with any Fein products as well. The head looks exactly the same, they just have that removable accessory ring. The plunge base is different .................. no dust shroud or depth stop on the old plunge base. But the attachment portion does look the same. I hope they are compatible. The attachment portion (labeled B in your pics) will be different. The new Starlock Plus System has a bigger diameter for the tool holder. I am using the old Festool parts (old corded Vecturo) on the current Fein SuperCut. The attachment needed to spend some time on the lathe for a quick “diet”. Well I hope they retained the magnet on the front of the base...however that may be the location where the new DC port is. That battery looks different than the other 18 volt. Are they compatible? It is a normal 3.1 ah battery. Those are normally packaged with the “compact” versions of drills etc. 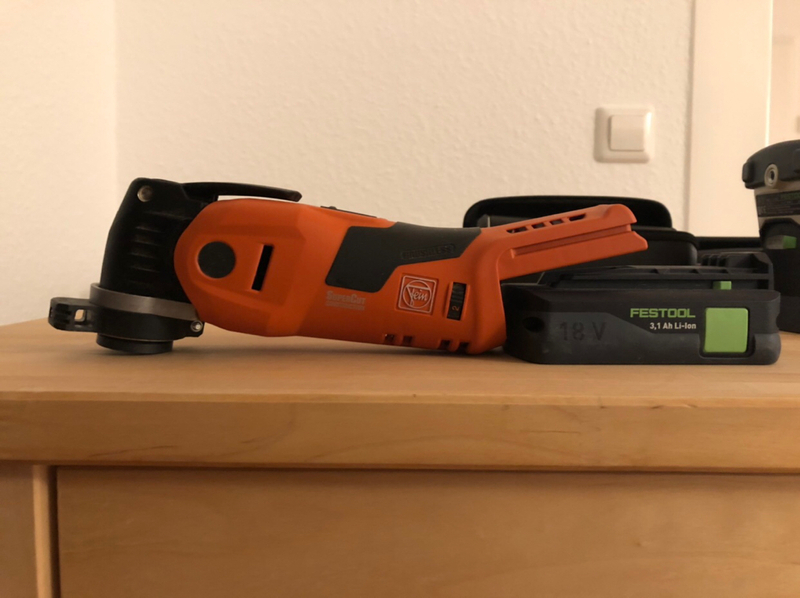 Additionally, I get the impression from the official specs on festool.de and from previous leaks that it only runs on the compact BP 18 Li 3,1 and not the larger pack (similar to how the circular saw only runs on the 5.2Ah variant, not the compact). Would like to be corrected if that's wrong. That is getting right to the point. Great demonstration, although I have no clue what was said. That's a relief - does the oscillator feel difficult to handle with the larger battery or is it pretty much the same with both sizes? Thanks for the video! I can only compare the Fein SuperCut 18V/5ah and 12V/2.5ah. I assume the Festool 3.1 will be similar to the Fein 18V/2.5 which I don’t have. But it will also most likely be the perfect balance between power and weight. With the 5ah, the SuperCut is a tad heavy and a little cumbersome to use. But it is still a nice machine. For any task where overhead/strange positions/twisted grip are needed, I much prefer the lighter battery with the tool. And at least in my use, the multitool is then mostly not used for extended periods anyway. I look forward to the Vecturo since that 2 degree oscillation makes quite a difference for tougher cuts. Never found my Supercut (corded) lacking. Never had a battery powered non Fein multicutter which has been more than just "ok". The dealer said that it won't take Supercut blades (of which I have 70+ blades...) but I am wondering if there perhaps exists an adapter or workaround for using Supercut blades on Starlock. I look forward to the Vecturo since that 2 degree oscillation makes quite a difference for tougher cuts. Never found my Supercut (corded) lacking. Never had a battery powered non Fein multicutter whih has been more than just "ok". Someone may come up with an adapter, but I do not see how any kind of adapter would allow for quick blade changes. The Starlocks do not have the long blade mounting pin. Yup, it is probably not going to happen - but considering Festool came from the same Supercut mount I was hoping they would come up with something to fit the existing blades. I don't mind a little hassle changing blades as long as the mount is sturdy. Dust collection and a depth stop make the kit more appealing to me. Cordless is also great for a multi-tool. Looking forward to this one coming to the US. It does not seem that we have to wait as long these days for new tools to make it to NA, which is always good! I needed a Multitool last year. I wanted new technology and did not want to wait. Since the Festool models are always just re-branded/modified versions of the Fein SuperCut, I just got a SuperCut last year. 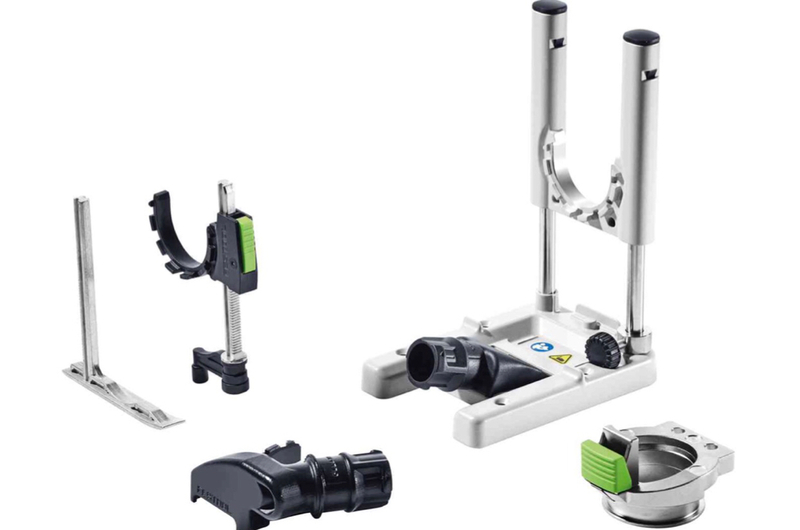 I like it very much and hope to be able to use the Festool-only accessories as well. I adapted the old plungebase, but will most likely get the new one, if there is some more convenience to the ease of use. Same for the dust collection accessories. I think if you need a tool like this, choice is yours. Obviously, the green looks fantastic as always. You have the Fein cordless one? How does it perform (battery wise)? My Fein is so old I have to use an Allen wrench to change the blade. The new Venturi seems to have a few improvements. I have the same model as you Michael...you forgot to add that after 20 minutes of use it's too hot to hold without wearing gloves. No complaints at all on the performance. Even on the tiny (and brilliantly light) 12V battery it does a great job. I also have one of the older Feins with the Allen wrench...mine's pneumatic. That being said I have an older Multimaster with all the accessories stored in two grey Tanos systainers. I bought a Supercut, not the new quick release, from Toolnut when they sold them in a systainer and then got the 18v cordless from them also in a systainer. The cordless is great, especially working off a ladder. The Supercuts both came with the adapter so I can use copious number of MM blades that I have. I have the Vecturo accessories, the plunge base and the depth adaptor and they fit the Fein Supercuts perfectly. Instagram photos New 18v Festool Vecturo with Starlock blade mounting. For anyone in Europe who already owns a cordless Vecturo, are you able to speak to whether the new and improved accessories (now with dust collection!) are a) backwards compatible with the older corded Vecturo and/or 2) compatible with the Fein Multimaster 350QSL? If the OSC ring fits over the head of the current version of the Multimaster and the associated bolt-hole pattern matches same, then this would open up a wonderful opportunity for MM owners to benefit from the dust collection advancements evident in the new OSC Vecturo. The question of compatibility has been asked multiple times both here and elsewhere but no one has yet responded to it. I, for one, am looking forward to the answer. I'm not exactly sure what the appeal of the small batteries on multitools is? I prefer a bit of weight in the tool as it damps down the pretty severe vibrations. The allowable usage time on these things is short enough as it is, you have heard of hand arm vibration have you? Also I often use the blade at 90 degrees from the tool as it seems to lessen the vibration even more.
. Don’t feel bad MK, my new 2.0 SuperCut has a bolt as well. It’s not a deal breaker for me though. Hey guys, the 18V Vecturo hit the stores today in Sweden. They arrived late yesterday at my local dealership and I did have a quick hands on with them today - unfortunately I got in the store five minutes before closing time so it was a brief stint with them! You CAN fit the New Starlock Vecturo accessory mount to the Starlock Supercut. You CANNOT fit the NEW Vecturo accessories to the OLD Vecturo mount. You CAN actually fit the NEW Vecturo Mount to the OLD vecturo BUT it does not allow correct operation, so do NOT do this, we only performed a test. We presume the same goes for the old supercut but we do not have a machine to test. You CAN fit the NEW Vecturo mount to the Starlock Multimaster BUT the Multimaster is only rated to Starlock plus so not recommended. DISCLAIMER, these tests were just to see if things physically fit we haven't carried out extensive testing , please follow manufacturers instructions at all times to avoid voiding the warranty. I'm curious what you mean by that? In what way is the operation impeded? But the new collet or adaptor is too deep hence the the blade doesn't seat correctly. on the new Vecturo the tool holder is deeper. pics below. Hopefully makes sense. Thanks...so when you put the blade in, the blade probably contacts the new adapter? Bring to America soon please! @Havwoods Accessories Ltd - Could you please expand on your statement: "You CAN fit the NEW Vecturo mount to the Starlock Multimaster BUT the Multimaster is only rated to Starlock plus so not recommended." I'm not sure what you mean by these machine's respective "ratings" and how this effects their use in conjunction with the new dust collection accessories. I own a 350QSL and would like to be able to purchase and utilize the OSC accessories since FEIN doesn't currently supply (and has never supplied) 'bladed' dust collection for the MM. I look forward to your reply. Also, feel free to PM me with your answer if youvre not comfortable sharing it publicly. is there any official word when this is coming to north america or canada? unofficial word? @usernumber1 no official word. Tools are typically introduced in the European market 6-12 months in advance of their debut in the U.S/Canada. No official word. Tools are typically introduced in the European market 6-12 months in advance of their debut in the U.S/Canada. 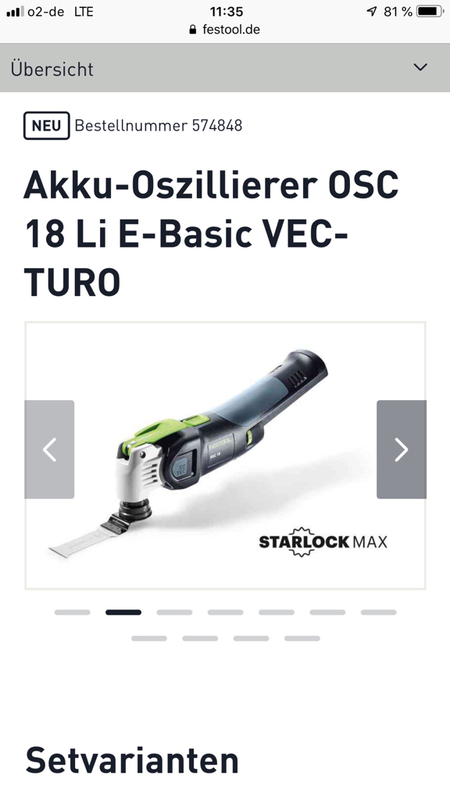 I just took a look at the 2019 Festool catalog and the OSC 18 is not listed in there. @Cheese , thanks for the heads up on a new catalog being out. I had no idea. For those looking for the catalog right now here is a link: https://www.festoolusa.com/knowledge/catalog-request Once you get to the interactive catalog you can use the little icons on the screen to download a pdf if you wish. It isn't populated on the webpage where the other catalogs are / have been. I'll add to that Peter that you MUST use the icons on the bottom of the screen/page to save it in .pdf form. I tried saving it as a web file and that completely destroyed its functionality. We haven't announced a date for the cordless Vecturo in NA yet. The FOG will definitely know once an announcement is made. Does anyone know if it's coming to Australia?